If the bellows have been cracked for a while it is an extremely high probability that dirt and water and grit have gotten up into the rack tube/rack bar assembly. Without a complete disassembly and cleaning, if you just put new boots on the rack the grit will soon wear away the soft bronze bushings inside and attack the gear teeth of the rack and pinion themselves. The result will be that you will have to either buy a new rack or get a used one and go through the service process on it that I will describe here. It's a no brainer. Either do it now for the expense of some grease and a set of boots or do it later with the added expense of buying a rebuildable rack. This is going to be a greasy messy operation so have lots of shop towels and cleaning solvent at hand. Mark the position of the steering column rod sticking up out of the rack relative to the split in the flex joint attached to the steering column coming down from the steering wheel. You can wash the area with alcohol to present clean metal and then use some really garish color of nail polish to mark the position. Don't have a garish color? Just ask any young thing less than twenty years old. Remove the clamp bolt at the flex joint. Now go down under the front of the car and release the tapered studs of the tie rod ends from their position in the steering arms. If you haven't done that before just ask here and we will advise as to the "easy way". Loosen the jamb nuts, hold the rods with some slip joint pliers and unscrew the tie rod ends from the steering rods, but carefully count the turns as you remove each one and make a note about that somewhere. Now remove the jamb nuts. 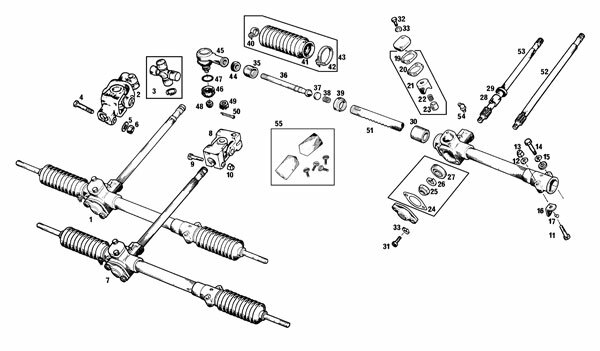 Remove the four bolts holding the steering rack to the frame of the car. Lift the rack away from the car, parting the column flex joint as you do, and set it on a bench with lots of clean working area around it. Remove the remains of the bellows and their clamps and trash them. There are spherical joints where the tie rods meet the rack bar. Undoing these might be the only difficult thing in this whole process, but it must be done. Bend back the locking tab and place the end of the tie rod in a vice near the joint and pull the vice tight. On most of the racks that I have encountered there are small "flats" in the tie rod that I suppose are there to serve as somewhere to place special holding tools instead of vice jaws. It might be best if you placed the rods in the vice here. Now use an appropriate size BIG wrench to unscrew the nut/cap securing and covering the joint and separate the two large bits. BTW: Often you will encounter a nut that has been so heavily torqued that it will seem impossible to loosen it with a wrench. If that is the case put on some eye protection and use a large chisel and hammer to strike the flats of the nut in such a way as to shock and loosen it. It doesn't matter if you bugger up the nut a little. You can always dress it with a file before you reinstall it. There is a spring and thrust cup and sometimes some small shims inside each of these joints. Don't lose them and take note of their order. With the rack assembly sitting on the bench and the rods removed, turn the column all the way to one side and then fully to the other direction counting the revolutions of the column as you go. I suspect that you are going to count three revolutions. Now turn the column back one half that distance (one point five revolutions?) and look at the rack bar as it protrudes from both ends of the tube. Make sure that it looks pretty even on both sides. Now look at the far end of the column and find the nail polish mark that you made earlier. Make a comment or sketch on your note paper as to where the mark was in relation to the plane of the rack tube. Take the rack/column assembly to the parts washer and clean everything that you can see. Back on the bench remove the two cap screws holding the thrust plate to the rack. The thrust plate is the plate directly opposite the end of the steering column shaft. Lift the plate away with care so as to not damage or lose any of the thin shims that might be under it. Set this stuff aside. Now remove the two cap screws holding the cap covering the spring loaded bronze slug that holds constant pressure on the rack bar. Again, remove this stuff with care and set it aside. Withdraw the steering column down through the lower opening in the tube where the thrust plate had been. Now withdraw the rack bar from one end of the housing. It will come out only one way. Lay all of the innards out in such a fashion as to help you remember the order in which they were assembled. Now take each bit to the parts washer one at a time and clean them to within an inch of their lives, draining and drying them as you replace them in their place on the bench. It is sometimes difficult to get all of the greasy goo out of the rack tube but with some effort it can be done. Use a light to peer up into the tube to make sure all is clean and dry when you are done. Assembly is essentially in reverse order but you want to be mindful of several things as you go along. Stuff some grease up into both ends of the tube before you insert the rack itself. I use bearing grease formulated for boat trailer bearings as it has an extra additive that repels water even more than normal grease. Slather grease all over the rack bar and then wipe it down a good bit before you insert it into the tube. Hand repack grease into the ball bearing at the end of the column. After inserting the rack into the tube install the column/pinion taking care to end up with the rack evenly spaced left to right in the tube and the column reset to it's earlier position relative to the plane of the rack. You might have to have someone hold the rack bar in position in the tube while you thread the pinion gear onto the rack teeth several times before you achieve the correct relative position. Once the column is "timed" correctly put some grease in the cavity of the thrust plate and bolt it back into position on the rack tube, but don't tighten it down too much yet, just snug it up. Now put the bronze pressure slug back into position in its bore greasing it well, especially on the face where it presses against the rack bar. Then install the spring and cover over it making sure that you replace the same shims that came off with it. Carefully turn the column back and forth a few times making sure that there is no binding. Now torque the cap screws for the cover plates and test for binding again. There should be none. 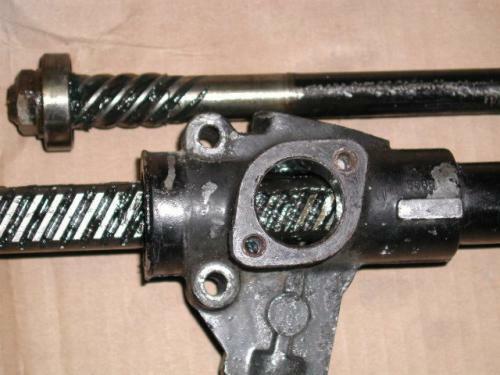 When you assemble the rack to tie rod spherical joint make sure that everything inside has a good coating of grease, the ball end, nut/cup, spring, thrust plate, etc. Now with the rack set equally in the center of the tube pull each of the boots over the tie rods and onto their place over the ends of the rack tube. Use the supplied cinch clamps to secure the boots to the tube. It is good practice to position the clamps in such away that the heads of the screws are going to be available for removal at a later date with the rack in position on the car. Now make sure that the small opening of the boots are positioned over the slight relief in the rods and secure the rubber neck around the rods with the supplied clamps, but don't tighten them fully just yet. Screw the jamb nuts back into position on the rods. Smear some anti-seize grease over the threads of the rods and install NEW tie rod ends counting the turns as you go and ending with the number of turns noted on our paper. Have someone sit in the driver's seat and hold the steering wheel centered dead ahead while you and another assistant install the rack assembly. Do so by offering up the rack assembly and inserting the splined end of the column into the flex joint according to your notes as you position the rack tube over its clamp beds. Install the rack clamps and bolts making sure that nothing is squished or binds. Re-install the column flex joint clamp bolt and secure the nut well. Have your sitting assistant turn the steering wheel slowly fully left and right a few times to make sure all is well and then return it to a centered position. Now reconnect the tie rod ends to the swivel steering arms fully tightening the nuts. Lower the car to the floor and jounce the front end to settle the suspension. With the steering wheel still being held firmly dead ahead step back from the front of the car, kneel down and sight down one side along the plane of the outside edges of one front tire toward the rear wheel. You should just be able to see the outside of the rear tire. If not, use slip joint pliers to turn the steering rod on that side into or out of the tie rod end to adjust the wheel direction as needed. Repeat this effort on the other side. Now jack the car back up again until the tires clear the floor. Hold a screw driver firmly against something stable like a jack stand with the tip just touching the center of the tire tread and have an assistant rotate the wheel so you can make a mark on the rubber all the way around the tire. Rub chalk on the tread if you can't easily make the mark on the bare rubber. Repeat on the other front tire. Lower the car to the floor and jounce the suspension again. With an assistant use a flexible tape measure to gauge the distance between the lines on the tires both on the front of the tires and the rear. You might want to do the rear measurement first as you will have to thread the tape between the exhaust down pipe and the body. Stretch the tape as high up as you can without fouling anything. When you move to the front of the tires try to take the measurement at about the same height off of the floor as you did on the rear measurement. Compare the readings. You should end up with the front measurement being 1/8th of an inch smaller than the rear. If it isn't, re-sight each wheel in turn and adjust the tie rod ends as carefully as you can to get that sight line to the rear wheel just right. Work with this measurement and sightings and adjustment process until you feel like the front wheels are straight with the body structure but are "toed in" just that little 1/8th inch. When you feel comfortable with your effort tighten the tie rod end jamb nuts and the small cinch clamps around the ends of the rack boots. Take the car out for a spin. If you feel that the steering is too twitchy the chances are that the wheels are not toed in enough. If it feels a little too clumsy the toe is probably set in too much. Work with the adjustment as needed to get the correct sight lines, toe measurement and feel when driving. Remember to loosen the clamp at the small end of the bellows before you try to rotate the tie rod. Another alternative of course is to put the car on an alignment rack and let a front end guy do the setting, but in any event always have someone sitting in the driver's seat holding the steering wheel in a straight ahead position. I have used this method countless times and although it might seem to be a bit time consuming I have never put a car on an alignment rack and had to do further adjustments. VOILA! A fully serviced steering rack that will transform the feeling of the car and with some care last a very long time! Comments on "Steering Rack Service"
I have just completed replacing the boots and gasket for the steering rack. The rack had been leaking oil past the gasket. I checked the repair manual and it states to use high pressure 90 wt oil (1/3 of a pint) to fill the rack. You have instructed to use grease on the inner joints and the rack. If anyone wants to add some photos to this article, send them along! Quote: "I have just completed replacing the boots and gasket for the steering rack. The rack had been leaking oil past the gasket. I checked the repair manual and it states to use high pressure 90 wt oil (1/3 of a pint) to fill the rack. You have instructed to use grease on the inner joints and the rack. Which is correct? Mike"
So what is the "easy way" for realeasing the taperd studs? Jack - is using VIOLA! a something close to French exclamation? Perhaps Viola (girl's name) uses 'Voila' (French for 'look there')? OK...what is the easy way to break the tie rod ends from the steering arm? Jack, great article. I have a real problem with mine - the end caps (holding the tie rods in to the rack) and lock nuts are stuck fast. A previous mechanic has struck the lock nut in several places (just not over the recess on the end cap!) and despite some careful levering I can't get them to move.If I just clamp on a big set of pipe wrenches and yank, am I in danger of damaging the steering beyond repair? I had also though about perhaps grinding a couple of flat surfaces onto it for leverage. Grateful for ideas! I have run into that sort of thing in the past. Extend the rack to its SHORTEST extension and grip it in a hefty vise. Then whack the fitting several times with a steel hammer before trying to undo it with a large adjustable wrench. Use sharp pressure applications. If that doesn't do it, try heating the fitting with an oxy torch. Good article. You might add something about needing some turning resistance for the inner time rod or some other means of determining wear. Thanks Jack - that did did the trick. Ended up using a pipe wrench anyway as there's nothing flat to grip, but it came away in the end. My damper is stuck #21 in the diagram. What is the best solution for getting it out? Thanks for a quick response Jack. Any ideas on what type of steel hook to use?